Background: Psoriasis is a chronic disease of inflammatory nature. It involves autoimmune mechanism and the systemic diseased state is created by the interaction of immune system, autoantigens and variety of environmental triggers. It is a complex skin disease which involves participation of numerous factors, making it multifactorial in nature. The main characteristics include proliferation of keratinocytes, increase in dermal vascularity and infiltrated immune cells. Among all factors, vascular alterations present a significant feature of the disease and angiogenesis seems to have an important role in giving rise to psoriasis phenotype. In the early phases of psoriasis there occurs sprouting of new blood vessels which disappear with disease clearance. Psoriatic lesions show highly altered vascular network in the form of numerous enlarged, tortuous and hyperpermeable cutaneous blood vessels. Secretion of various pro-angiogenic growth factors promote the expansion of vascular network in psoriatic skin cells. In addition to pro-angiogenic growth factors, pro-inflammatory cytokines also contribute to this process by activating endothelial cells and exerting pro-angiogenic action as well. Angiogenesis, in psoriasis display a close association of vascular endothelium activation, angiogenesis, inflammation and lesional skin, as is demonstrated by in vivo models. Objective: The present review discusses angiogenesis as the central process in the evolution of psoriasis and summarizes various angiogenic mediators and their respective roles in the development of psoriasis. Conclusion: Anti-angiogenic therapies targeting vasoproliferation may represent a valid approach for the development of anti-psoriatic drugs and further development in this field can pave way to new fields of treatment. Such therapies could be at par to those directly targeting inflammation. Keywords: Angiogenesis, psoriasis, vascular endothelial growth factor, angiopoietins, hyperproliferation, keratinocytes. Keywords:Angiogenesis, psoriasis, vascular endothelial growth factor, angiopoietins, hyperproliferation, keratinocytes. Abstract:Background: Psoriasis is a chronic disease of inflammatory nature. It involves autoimmune mechanism and the systemic diseased state is created by the interaction of immune system, autoantigens and variety of environmental triggers. It is a complex skin disease which involves participation of numerous factors, making it multifactorial in nature. The main characteristics include proliferation of keratinocytes, increase in dermal vascularity and infiltrated immune cells. Among all factors, vascular alterations present a significant feature of the disease and angiogenesis seems to have an important role in giving rise to psoriasis phenotype. In the early phases of psoriasis there occurs sprouting of new blood vessels which disappear with disease clearance. Psoriatic lesions show highly altered vascular network in the form of numerous enlarged, tortuous and hyperpermeable cutaneous blood vessels. Secretion of various pro-angiogenic growth factors promote the expansion of vascular network in psoriatic skin cells. 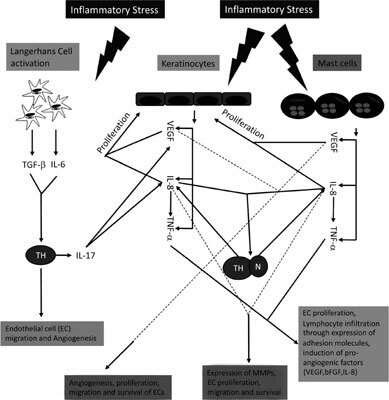 In addition to pro-angiogenic growth factors, pro-inflammatory cytokines also contribute to this process by activating endothelial cells and exerting pro-angiogenic action as well. Angiogenesis, in psoriasis display a close association of vascular endothelium activation, angiogenesis, inflammation and lesional skin, as is demonstrated by in vivo models.